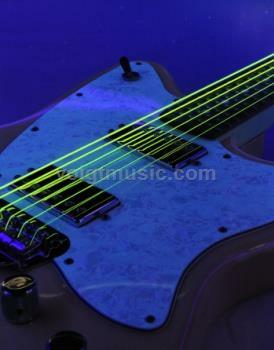 Nickel Plated Electric Strings wound on Hexagonal Cores NEON™ is the second in DR's SuperStrings™ series. Super bright in day light, and with stage lighting. DR's NEON™ strings are so bright in appearance "they look like they are on fire." DR's NEON™ strings shine brightly under stage lights, and are 100% black light active so they glow strongly under UV lighting. And DR's NEON™ sound as good as they look. As Joey Clemment from Salena Gomez said, "Yeah they look great, but they sound incredible!"